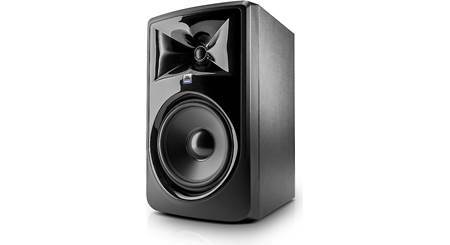 These Mackie MR824 monitors will help you create a great-sounding mix in just about any studio environment. 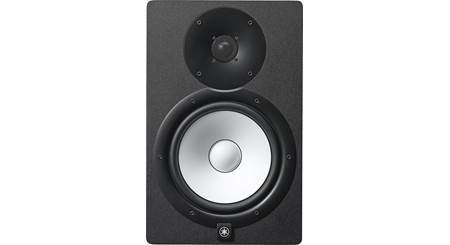 These Mackie MR824 monitors will help you create a great-sounding mix in just about any studio environment. They're bi-amplified, with 55 watts going to the robust 8" woofer, and 30 watts powering the 1" soft-dome tweeter. 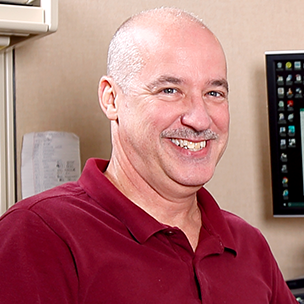 A logarithmic waveguide design offers balanced, ultra-wide dispersion. 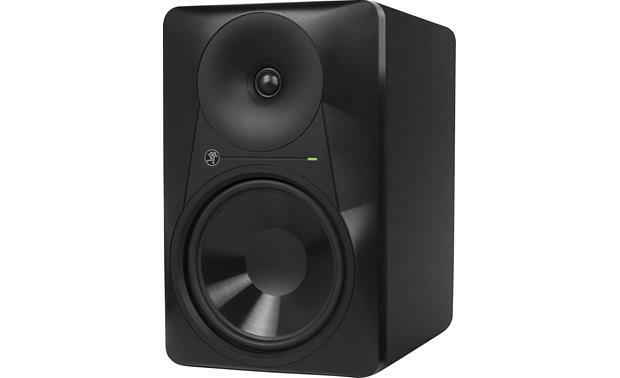 Mackie MR824 powered studio monitors offer plenty of inputs and switchable filters to keep your music sounding right. A three-position Acoustic Space switch on the back helps you match the speaker's sound to your room and your personal listening preferences. There's a high-frequency filter (-2dB, 0, +2dB) so you can further tweak performance to meet your expectations. 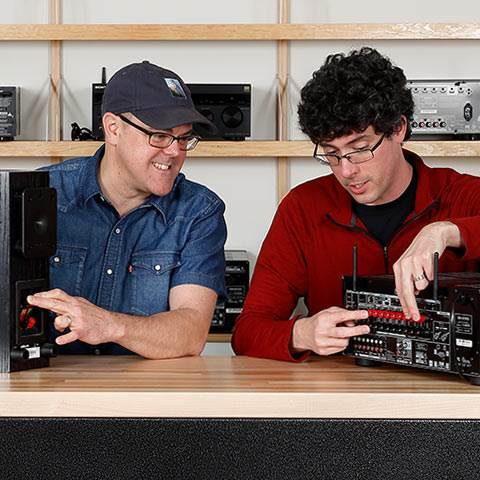 Making connections is easy: each speaker features a balanced XLR, balanced 1/4" TRS, and an unbalanced RCA input. 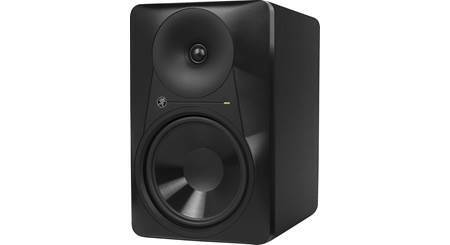 Overview: The Mackie MR824 studio monitors are designed for superior mix translation and accuracy in any studio. They feature a 8" polypropylene woofer, for dynamic low-frequency response, and a 1" silk dome tweeter that provides a fast transient response for detailed high-end and clarity. 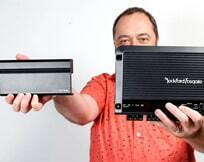 Each driver is powered by its own Class AB amplifier with the woofer's amp providing 55 watts and the tweeter amp providing 30 watts. 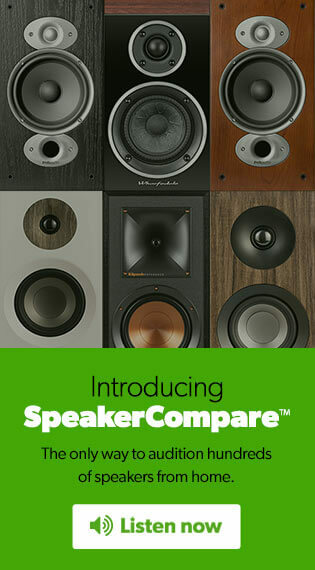 The all-wood enclosure with internal bracing is acoustically optimized with internal sound-absorption material, reducing distortion and enhancing the low-frequency response. Logarithmic Waveguide: Mackie's logarithmic waveguide technology provides an ultra-wide listening sweet spot and enhanced stereo imaging for increased clarity and consistent sound over a wide area of the room. 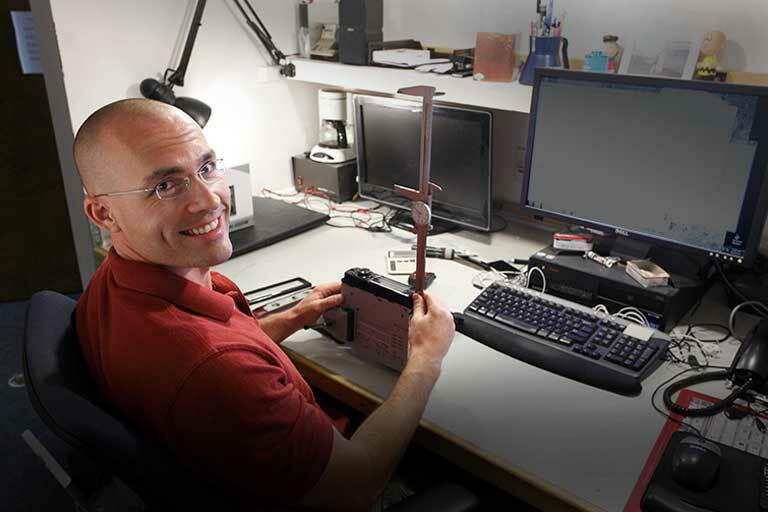 Precise acoustic alignment offers incredibly balanced sound across the entire frequency spectrum. 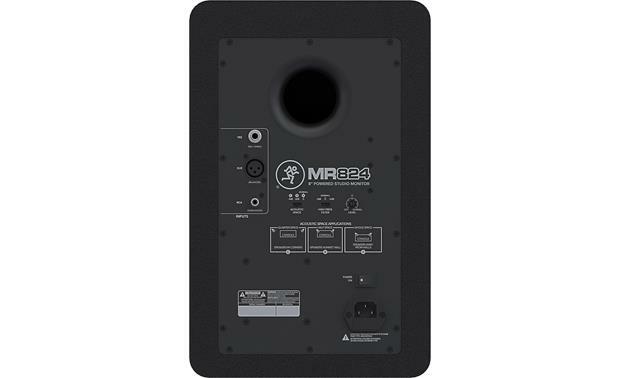 Acoustic Space Control: The MR824 includes two features for enhancing the speakers performance, an Acoustic Space control and a High Frequency Filter. 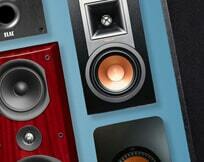 The Acoustic Space Control setting compensates for wall- or corner-loading the speakers by changing the bass response. 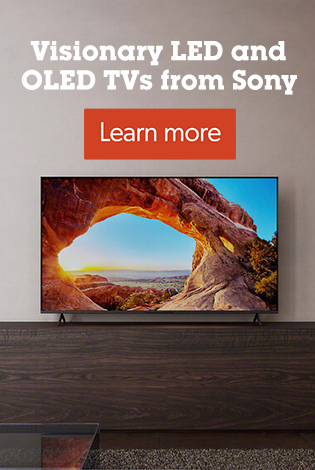 Three settings are available: Speakers in corners, speakers against walls, and speakers away from walls and corners. 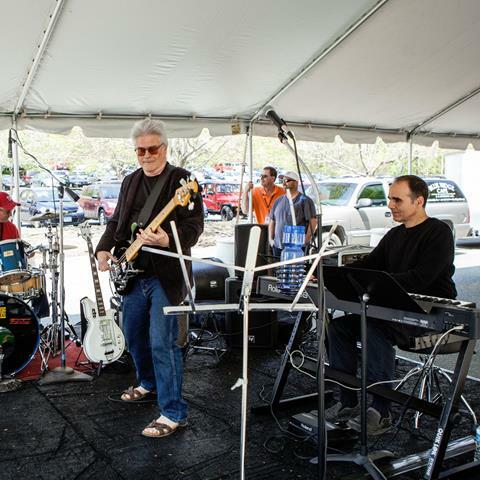 A High Frequency Filter provides either a boost or at 3 kHz to compensate for particularly dull or bright sounding rooms. Options are: -2 dB, 0 dB, +2 dB. 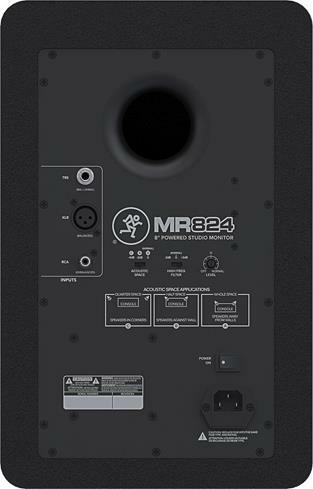 Inputs: The rear-panel of the MR824 includes 3 different inputs connectors, a balanced XLR jack, a balanced/unbalanced 1/4" TRS jack, and an unbalanced RCA jack. 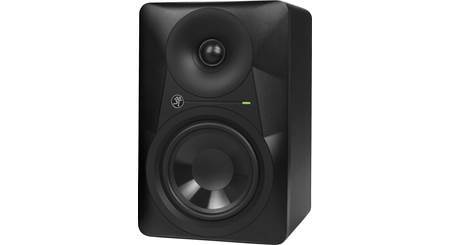 Searches related to the Mackie MR824 2-way powered studio monitor with 8" woofer and 1" tweeter.